If you read my Giant Beauty Haul post you will know I have been eyeing up this product for quite some time. Huge bloggers and YouTubers were all non stop talking about this cleansing milk and I just needed it. This soap and glory peaches and clean cleanser is a 4-in-1 wash off deep cleansing milk. Still a little confused? Okay…it melts away your makeup ( supposedly) and purifies and clarifies your skin. Not only that but it energizes AND soothes at the same time. Pretty impressive right? Basically, if you’re still a little lost…It’s a cleanser that takes away your makeup and makes your skin feel fab all at the same time! Hopefully you know by now that I was already blown away in excitement after receiving the soap and glory cleansing milk in the post. In fact as soon as boots took my order I felt an overwhelming sensation of excitement. I took a cotton pad (as directed, I am not going to pretend I did this all by myself) and began applying the cleansing milk to my makeup. I even had my boyfriend look in to witness the magic of peaches and clean unfolding on my face. I love the texture of this soap and glory cleansing milk. I thought it was going to be a lot more watery but, it’s like a creamy texture. I also loved that I only needed 2-3 pumps and it really covered my face. As I began wiping I did feel a little disappointed at first. I stupidly truly wanted my makeup to melt off! I don’t really know what I was expecting, I just assumed it would start sliding from my face. After a few more wipes with my cotton pad and disappointment almost flooding over me (I said almost!! ), I looked up from the sink and saw my face had no more makeup left on it. I was astounded! I couldn’t actually believe that a cotton pad and some cleansing milk had managed to remove a lot of high coverage makeup! Once the stinging had stopped and I was no longer convinced I would go blind, it wasn’t too bad really…it just was a bit embarrassing considering the show I made to my boyfriend. I am not the greatest ‘peach‘ fan. I don’t like the fruit, I don’t like the synthetic tasting sweets and well, really I don’t like anything peach( Aside from anything made by Aussie!! ). However, because I was trying to be fabulous I ignored that the packaging and the actual product is called ‘peaches and clean‘. To my horror and delight the cleansing milk smells peachy but, it has a hint of mint in there too (something I love!). Once my face was rid of makeup and rinsed with water it left my skin smelling really nice, the peach wasn’t overpowering and the minty smell was really subtle. 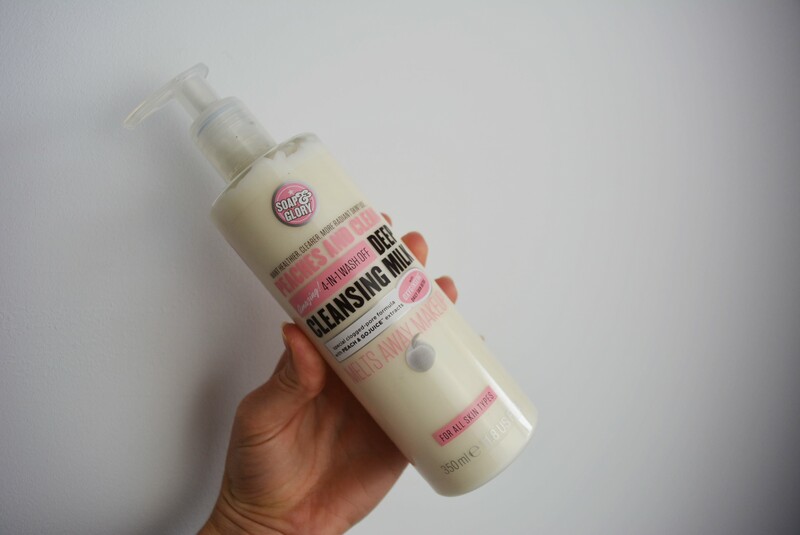 I love the smell of this soap and glory cleansing milk, it makes a change from the usual smells of face cleansers. I love it. I really do. It made my skin feel amazing, it didn’t necessarily melt off my makeup but, it took it away (perhaps we could email soap and glory and bring this up with them?….Of course I am joking, I just feel a little silly since boasting about its ‘melting’ properties!). I love the smell, i love the huge bottle and the price isn’t really too bad. I got mine for 6 pounds in the sale but, I think it’s usually around 8 or 9 anyway. It’s really worth it and so nice on any skin type. My only con with the soap and glory peaches and clean cleansing milk is the fact that you can’t use it on your eyes! It’s also quite drying but, nothing a little bit of moisturizer can’t fix. You can get soap and glory Peaches and clean for the best price online by Clicking Here If You Are In The US and Here If You Are In The EU. I hope you enjoyed this review on the 4-in-1 cleansing milk from soap and glory. If you did, please let me know in the comments below and let me know what you thought of it! Next Story → Matte Lipstick Review – Must Read Before You Buy!